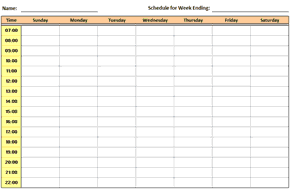 Description: Simple Excel Weekly Schedule Template to help you to plan your week. The schedule is split into hourly sections and has a column for each day of the week. The above weekly schedule template has a space for for each hour of the day, between 07:00 and 22:00, for each weekday. However, these labels can easily be changed and rows or columns can be added or removed from the schedule, to suit your own requirements. The cells are formatted to allow the text to wrap around (see the wrap text in Excel page), and so the cells will expand to fit the text that is typed into them.